By this time your puppy will have all of its puppy teeth. Now the puppy will start to chew on anything available, including you. This is one of the main reasons I get calls from new puppy owners. They don’t know what to do, and especially if there are small children around, it can really be problematic. 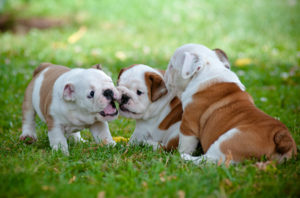 Take heart in knowing that almost all puppies chew and play bite. They are exploring with their mouths, or sometimes trying to soothe their sore gums. It’s also how puppies learn bite inhibition, and if they don’t explore bite pressure, they won’t know how much is too much. 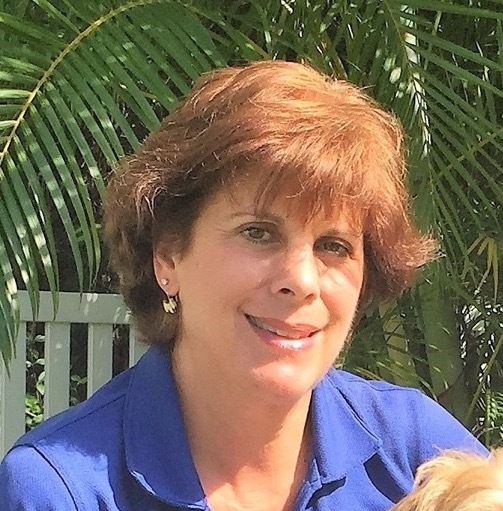 The puppy’s mother and littermates provide feedback while the puppy is still with the litter, but once the puppy is in your home, now it’s your job. It is a phase that puppies and their owners have to get through, and it will take time and patience. 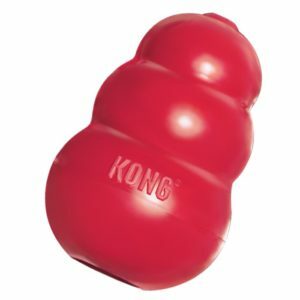 A classic Kong toy with a small amount of peanut butter or cream cheese rubbed inside and frozen. I always keep a variety of these types of toys in my freezer when I am raising a puppy as they are safe and will keep the puppy entertained for quite a while and they are very safe. There are various sizes and colors of Kongs, The red ones are for the normal dog, the black ones are for the more powerful chewers. You may have to buy different ones as your puppy grows. 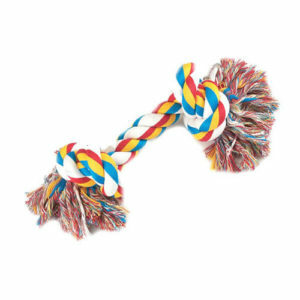 A rope toy soaked in low-sodium broth and frozen – this will attract the puppy to chew on it, and will help sooth the puppy’s gums. I will admit, it does get a bit messy, so give this to the puppy on a hard surface. You should always supervise the puppy while using these just in case the puppy gets some of the rope apart. You don’t want the puppy to eat it. 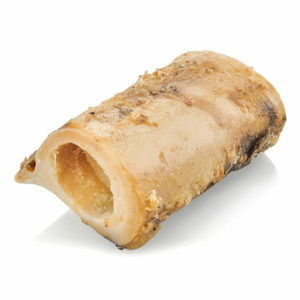 Marrow bones and other natural chews are good things for your puppy to chew in limited amounts as sometimes they are too rich for the puppy’s digestion. 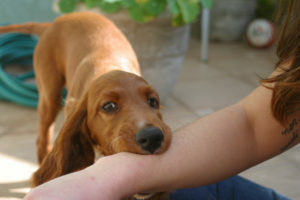 Play Biting: I often get calls from new puppy owners saying that their puppy is becoming aggressive. Often a puppy will be rather subdued for the first week or two, but once it becomes comfortable in it’s new environment, the puppy starts to become a little more assertive and playful. The puppy is just playing with you like it would another puppy, and especially if there are small children around, that can be scary. The puppy isn’t trying to hurt anyone, but puppy teeth are sharp. Other puppies have fur and loose skin so when they play, it’s not a big deal. But humans don’t and play biting can hurt. When your puppy tries to chew on you, never hold his mouth shut, pinch his cheek or tap his nose. If you become physical with the puppy, you are teaching your puppy that’s OK. Also, many of the things I have seen people do to address this issue actually seem like play to the puppy and it will get more excited. If the kids are running away or squealing, that’s lots of fun for the puppy. You need to teach your puppy what is appropriate for him to chew. As with a teething baby, providing frozen chew toys helps to redirect the puppy’s energy and efforts to play. You can also spray hands and clothes with the bitter spray to make those things unattractive to the puppy. This is a good time to put the puppy in the x-pen with a few good toys so the puppy can’t continue to jump up and play bite. Increasingly, your pup will need strong leadership from you so he always knows that the people in your home are the pack leaders. Further challenges at this age occur when your puppy shows increased independence and stubbornness. If you haven’t done so already, now is the time to start training. Keep learning fun for your pup because he’ll learn more if he enjoys his lessons. Try to keep training sessions to about 15 minutes at a time. If you or he get frustrated (remember, he is a puppy! ), just stop, play a game, and then try again with an abbreviated lesson followed by lots of praise.